Residue from dry shampoo and styling products can lead to itchy scalps and dull strands. 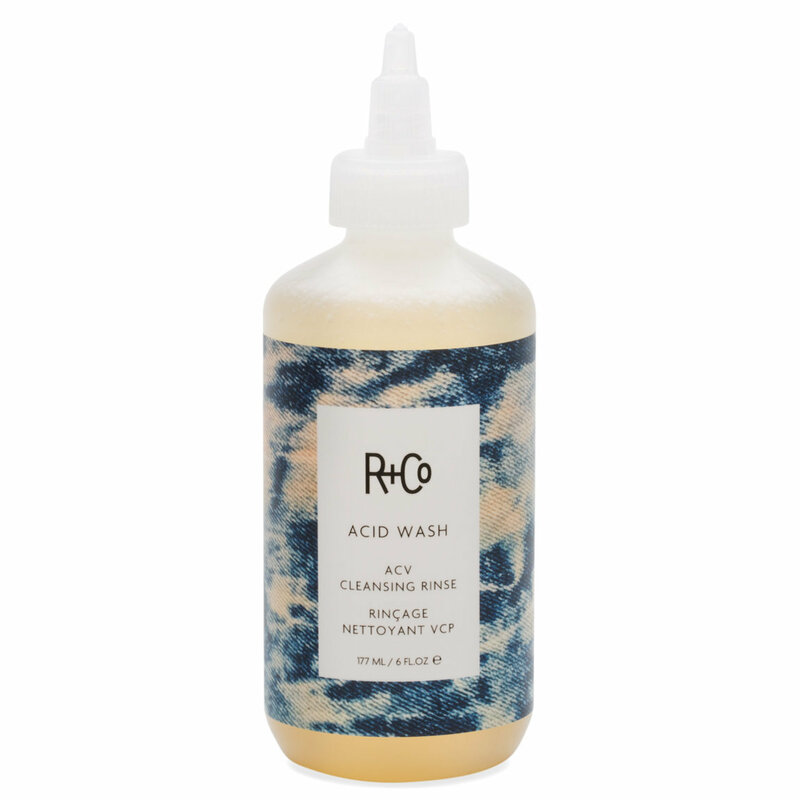 Hit reset with R+Co’s Acid Wash ACV Cleansing Rinse, which deeply cleans and clarifies to restore hair to a naturally soft and shiny state. Formulated with apple cider vinegar, this gentle cleanser purifies hair and scalp for lustrous locks and a calm, happy scalp. Apple fruit extract breaks down product build-up, exfoliates away flakes, and nourishes the scalp with soothing moisture. Packed with essential fatty acids, tamanu seed oil cultivates a healthy scalp environment while restoring vitality to lifeless strands. Aloe vera leaf juice replaces moisture to strengthen and nourish the hair cuticle. Apply to wet hair, gently squeezing the formula from the precision tip directly onto the scalp. After thoroughly massaging throughout your hair, leave in for 1-3 minutes. Rinse. May be used as a shampoo substitute or a conditioning treatment for co-wash users. NO SHAMPOO NEEDED. SQUEAKY CLEAN BUT NO STRIPPING! ACV= Apple Cider Vinegar! I've been doing the ACV rinse (with just Bragg's ACV and water) for the lonnnnnngest time but I actually had been on and off purchasing actual products targeted for this purpose over the past few years. So you know, sometimes I'm fancy and sometimes I go real low key, budget friendly. Either way, I found that I love R+Co's the best (I'm also just a HUGE fan of the line overall) and the scent is just so light, citrus-y and refreshing. I like to squirt it all over my scalp and use this in place as my shampoo. It actually suds up, which was the biggest surprise for me the first time I used it! So it gives me the act of shampooing my hair. You don't need a whole lot but be sure to really get the roots. I like to do dab some conditioner on the ends and only ACV the roots (for conditioner right now, I'm using Oribe's Gold Lust) then I will rinse the whole thing out after a few minutes and that's it. It leaves the hair feeling clean and all of the residue build up from all my hairspray is removed but without feeling dry or straw like. One bonus is that it also helped to get out some of the gnarly tangles that build up in my hair really fast. My hair has looked shinier and has more bounce to it. I tend to only do this about 1x a week, just to get all the gunk out but no need to really do it more than that. I'm really into scalp health right now so I'm super excited to have this and their Scalp Scrub in my bathroom right now!! I received this product as a sample. I would have never looked twice at this kind of product but I am so delighted I tried it. It is a light alternative to washing between washes without the drying effects of soap based shampoos. Smells good, easy to use and very effective in restoring a freshly washed appearance to my hair and scalp. This came as a sample with my purchase and I tried it out and loved it. It left my hair feeling clean without being over conditioned or leaving a residue. Will order a full size in the near future. Absolutely awesome ! It feels clean and fresh. It’s quite additive that you’re always looking forward to take a bath to wash your scalp. My new to go hair products of 2018, and now 2019! I happen to have loose curly hair and didn’t know my hair and scalp needed this until I gave it a try. This is a hair treatment made out of apple cider vinegar which helps the pH of your scalp and balances out any issues you might be having. Towards the end of the year it is really cold and I develop a bit of dandruff and have an incredibly itchy scalp. To remedy this instead of over washing (which would strip the natural oils my curly hair needs) to alleviate these issues, I use this along with a cleansing conditioner and my hair has never felt better! Apart from containing apple cider vinegar, it also contains one of my favorite ingredients for hair which is Aloe Vera which is a fantastic ingredient for curly hair as it is highly moisturizing but when applied to the scalp it helps alleviate any itchy or dry patches since it is an ingredient known to help alleviate inflammation. 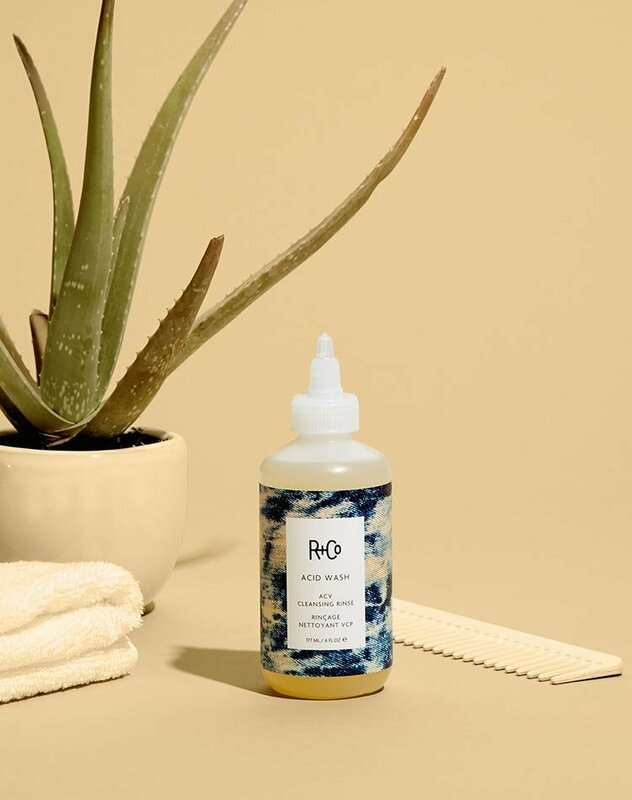 While using this product, I was able to notice the difference overnight and have continued to use this as a restorative treatment to heal my scalp from all of the dry shampoos and curl creams I use to have my hair looking gorgeous and bouncy. If you are having any issues with your hair, whether it be an itchy and dry scalp, dandruff or just want to deep clean your hair this is by one of the best problem solvers out in the market. I am in love with this rinse! ACV Acid Wash felt so good on my scalp and left it super clean. The smell is not over powering or harsh. Build up and dry scalp gone! with just one wash and it did not ruin or mess with my platinum hair what so ever which was one of my concerns on trying out this product. Received a sample in my order and so far I’m really liking this, have only used twice but I’ll be ordering the full size bottle. Thank you Beautylish. I was gifted this after purchasing 2 mini lip kits from JS. It was my first purchase from Beauty Lish. I love that they gave me this for free but was also very skeptical. Nonetheless I did try it out the first night when I got in the shower. I WAS SO IMPRESSED! I focus on the roots and massage the scalp after. It feels so nice! I’ve heard using ACV on your hair has really great benefits and I’ve been meaning to try it and so it was perfect timing. Once I run out I’ll definitely be buying more! My hair feels so clean after each use. My scalp felt so genuinely clean after using. It was a sample I received with a purchase, and I will be purchasing a full size. The packaging is fantastic and ive used it on my fave, and it left my skin feeling smooth and refreshed. I highly recommend!